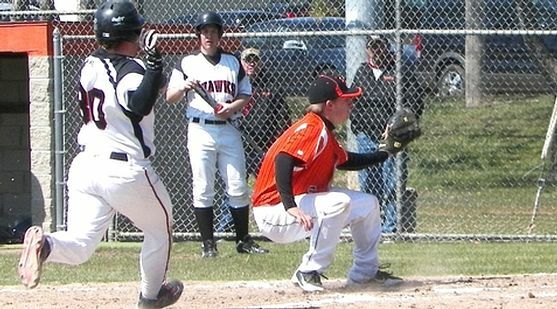 ESCANABA---The Escanaba High School baseball team had its four-game winning streak snapped Saturday afternoon as the Shawano (Wis.) Hawks beat the Eskymos, 7-1, in the first game of a doubleheader at Al Ness Field. The Hawks broke open a close game by scoring four runs in the fourth inning. Escanaba committed five errors in the game, and also walked six batters and hit two others. In the second game, the Eskymos lost, 1-0, with only freshmen and sophomores (and two juniors) on the field due to the Escanaba High School's Junior/Senior Prom. Tim Lueneburg leads off as Kenny Casper throws over to first base. Kenny Casper went the distance on the mound for the Hawks in the opener, allowing the Eskymos just two base hits: an RBI single by Alex DeHaan in the first inning, and a third inning single by Nick Vandermissen. The Eskymos could not take advantage of four Shawano errors, as the Hawks dropped several pop flies due to 40-mile-per hour wind gusts. The Eskymos had picked up 48 base hits in their four previous games, but Casper mixed his pitches well and kept the batters off-balance. "I think that maybe being prom day, the kids had other things on their minds and they just weren't here," Eskymo Manager Kirk Schwalbach said. "We gave them seven or eight extra outs (in the first game). I told the kids that we had our one 'really bad game' for the year. We all played bad, especially in two of the innings." The second inning was brutal for the Eskymos, as they committed four errors, helping the Hawks break a 1-1 tie. DeHaan was able to get a ground ball to leave the bases loaded, but because of the miscues, his pitch count started to rise. And in the fourth inning, Shawano took advantage, as DeHaan walked the first man he faced, and then hit the next batter. Josh Carlson singled to load the bases for the Hawks, and then Lukas Postal and Hunter Hoffman followed with RBI singles. Two other runs crossed the plate during that dreadful inning on a passed ball and wild pitch. The Eskymos were down 6-1, and even though the Hawks dropped two pop flies later in the game, Casper was pitching too well to allow any kind of a comeback. DeHaan was the losing pitcher, and was relieved on the mound by Vandermissen in the fourth inning. The team's three seniors and two juniors left immediately after the game to attend the Escanaba High School Junior/Senior prom, leaving a team full of mostly freshmen and sophomores to play in the second game of Saturday's doubleheader. Juniors Tim Lueneburg and Andrew Sedlar didn't go to prom, choosing to play baseball instead. The second game got off to a bad start when starting pitcher Ben Kleiman walked Branon Laabs, and then threw his pick-off throw beyond first base. That moved Laabs to third base, and he scored on an infield hit by Carlson. Who knew that the run would be the only one scored in the entire game? The Eskymos got a boost from freshman catcher Sean Bissell, who threw out three runners trying to steal bases in the game. And doing so against a 40-mile per hour wind. ""I guess it was just good mechanics and following through," Bissell said of his defensive success. "The wind definitely held up the ball. I had to throw the ball harder, and a little higher, just to make it to second base so it wouldn't die first." "He did a nice job behind the dish," Schwalbach said. "I'm finding out a lot about these freshmen. They're gamers, that's for sure. I feel comfortable putting him in any time." Bissell also got Escanaba's second base hit of the game (Jeff Lyle got the first), a sharply-hit liner to left field in the third inning. But he missed the coaches' signs and tried to make it to second base and was tagged out. "Sean ran through that (sign)," Schwalbach said. "He was excited. But I asked him, 'did Coach (Randy Kleiman) send you? ', and he said, 'no'. He's a freshman. He'll learn." "That was a mistake on my part," Bissell admitted. "Miscommunication." Kleiman pitched a strong game after his shaky start, making it five innings, and allowing just four hits (two of them by Mike Stupecky). Kleiman gave way to Sedlar, and the tall righthander bounced back from Friday's rough outing by pitching scoreless sixth and seventh innings. Sedlar was aided by two excellent defensive plays by Lueneburg at shortstop, and two catches by Lewis Ostrander in deep center field also helped. But Laabs was just as strong on the mound as Casper was earlier in the day. At one point, Laabs retired nine straight Eskymos, with all of the outs on the infield. Alec Slaga beat out an infield hit in the sixth inning, but Ostrander hit into a double play to end the inning. And in the seventh inning, Sedlar was safe on an error, but was thrown out trying to go to second base. Laabs faced the minimum 21 batters over the seven innings, tossing a three-hitter. He did not issue a single walk in the game. "I was proud of the kids," Schwalbach said of his young crew. "We just couldn't get anything going. We made some mental mistakes. That's what I talked to the kids about after the game. When you're in a close game like that, all the little things mean a lot. We just couldn't get the timely hits. And we lacked a little team speed in that one." "I feel good about where we're at, and about what I now know about this kids," the coach continued. "We're 4-2 and we're moving forward for some more games this week." Shawano improved to 5-4 on the season. The Eskymos fell to 4-2, and will stay home for another game on Tuesday against Norway. Game time is 5:30. It wll be broadcast live on WCHT-AM (600), and will be streamed on-line at www.rrnsports.com. NOTE: Click the thumbnails in the "Article Highlights" box to see even more photos from this doubleheader. Thanks to the Eskymo moms for using our camera to take these great shots for both the boys!